Prime Minister's Office categorically denies reports that Netanyahu agreed to a quiet construction freeze in Judea and Samaria. Prime Minister's Binyamin Netanyahu’s Office on Sunday categorically denied a report by journalist Ben Caspit in the Ma’ariv newspaper, in which he claimed that Netanyahu agreed during negotiations with Zionist Union chairman Yitzhak Herzog to freeze construction in Judea and Samaria. “It never happened,” the Prime Minister’s Office said in response to a question from Arutz Sheva. 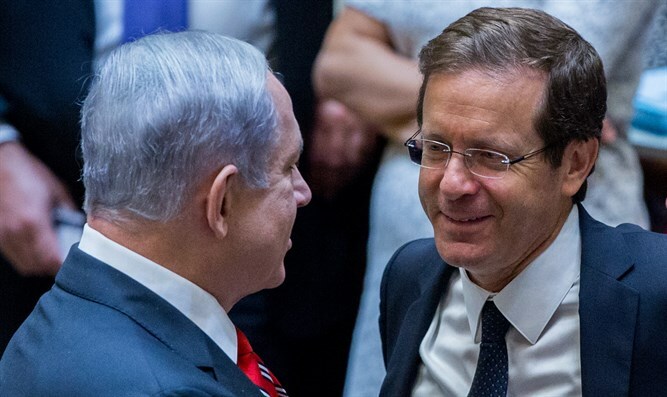 Caspit’s report is the latest in a string of media reports of renewed coalition talks between Likud and the Zionist Union. Herzog rejected the most recent reports that talks took place over the Rosh Hashanah holiday, but also refused to commit to not entering Netanyahu's coalition. “I make decisions responsibly. Netanyahu is in survival mode, and in most cases he prefers personal interest to national interests. I take the national interest into consideration,” he said.